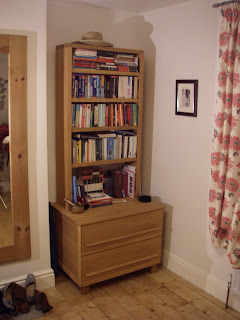 In between the larger construction carpentry projects, I'm always glad to take on furniture and garden commissions. 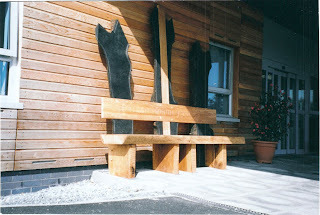 Most are of Cornish Hardwoods, with a pegged and wedged assembly that reflects the joinery techniques in the larger scale building work. Generally I like to finish them with a clean, light oil, giving durability while allowing the character of the wood to remain accessible to sight and touch. I made the above bed for my sister in 2004 using ash and spaulted beech from Tino Rawnsley's timber yard near Wadebridge. Its assembly involves just 4 wedges, for ease of carrying up narrow stairways. The bed below is again of ash, with nice olived features in the head and foot boards, this time assembled using pegs. 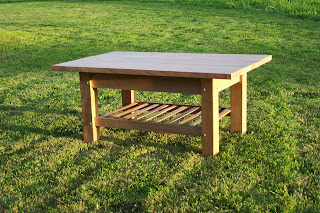 This garden bench was made using leftovers from a large oak frame we built in Hampshire, and using framing style joinery...all pegs and wedges, not a nail, screw or drop of glue in sight (2005). Solid Oak doors; framed, ledged and braced (2007). 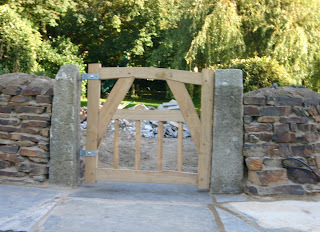 Hand-split Sweet Chestnut garden gate, pegged mortise and tenon joinery (2007).